Pair of Westfield Build stands, in perfect working order. They have some surface rust but this would clean off with a light sanding. Dry stored and not outside! Collection from Bristol, BS4. Great thanks guys, my garage has a low roof so will need to see what clearance I have. I can definately see the access benefits of the stands. Hi All, I am selling a genuine Westfield Stainless Exhaust system with manifold for a crossflow. This came with my project pre lit Seven SE car but I am going a different engine route. It is in good condition. There is a Westfield branded plate welded onto the exhaust manifold which says 1711002 then 16521 then JC. Not sure what this means but I assume it is a part number and the initials of who welded it. The exhaust is currently on ebay but I am open to offer; https://www.ebay.co.uk/itm/223071465020 Located in Bristol, I can ship if required. Interesting, well David cheddar is a lot closer than Bridport! I do enjoy a trip to Haynes motor museum, the food when I went was excellent and if you are member of the caravan club which my in laws were, you get in for free. Not sure if wscc qualify for a discount... As a member currently rebuilding a Westfield, I have not actually been in one so was hoping to shotgun a ride in someone's locally. Mystery chassis can you help identify? The Chassis sold on ebay and was collected by Sam and his Dad. Top blokes, and a unique way of moving a chassis... 4 bloke lift to get it on the roof. No paint scratched which is amazing. It then went for a 2 hour blast from Burnham on Sea to Solihull up the M5. Looks a bit like Santa's sleigh. Thanks All, the chassis is up for sale on ebay and listed as a locost, currently selling for a staggering £102, which no doubt will end up being about £50 after ebay and paypal fees are taken off. The engine and gearbox are making their way into my 87 prelit rebuild. Check out my build diary 'Back from the dead 1987 pre lit' in the builds section of the forum. Appreciate the responses. Good thinking Thrustyjust regarding the painting. That still feels a million miles away! 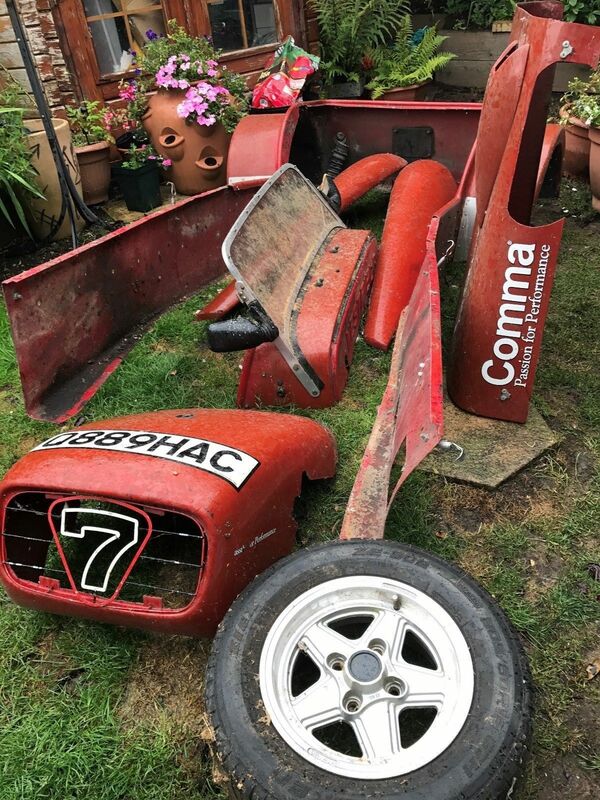 So latest updates; Mystery chassis with caterham K Series engine and ford gearbox delivered; Then I removed the engine and box; Took the chassis back to a chassis and now its up for sale; Those with a keen eye will notice that this is a different garage. I did the stripdown at my parents house as there was more room, and hired a van to move the pieces. Next job is to sell / chuck out everything that is surplus to requirements. Including all the old crossflow blocks, type E gearbox, wheels etc... to make room so that the build can actually begin.